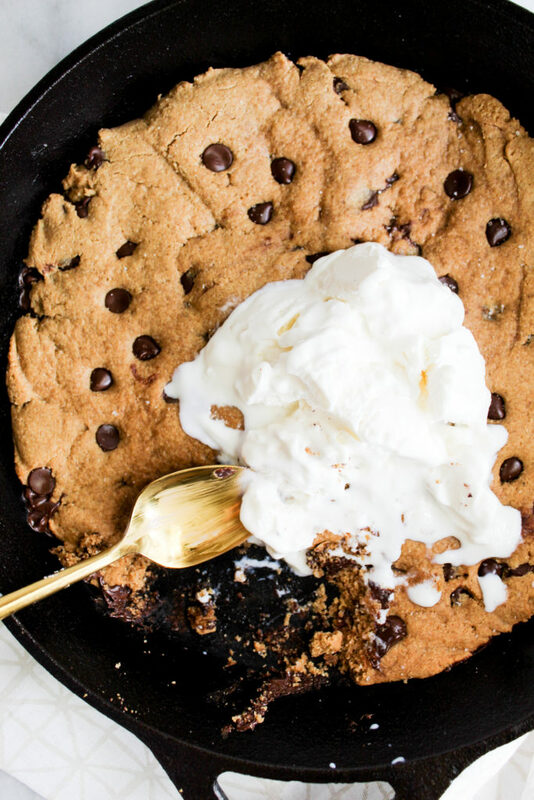 This Paleo Chocolate Chip Cookie Skillet is loaded with healthy, paleo friendly, gluten-free ingredients! It’s gooey and delicious! Eaten best when warm with a big scoop of ice cream! Y’all. 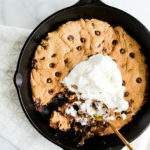 Can I just tell you how happy I was to make this cookie skillet?! It’s so amazingly good. I wasn’t even mad when I had one in my house everyday for a week when I was recipe testing it. I seemed to always make my way to the skillet to have a bite to continually test and make sure it was edible. And oh baby, it surely was. Also: warning – this recipe doesn’t produce a lot of dough. Make sure you don’t make the same mistake I did by eating spoonfuls of the dough before-hand. No matter how stinkin’ good it looks! 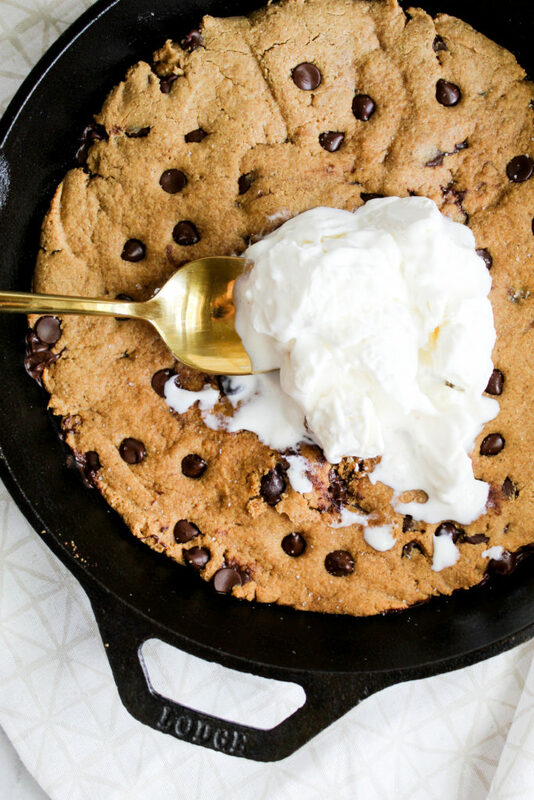 This cookie skillet is so gooey, warm and delightful. I can’t even believe that it’s Paleo friendly. 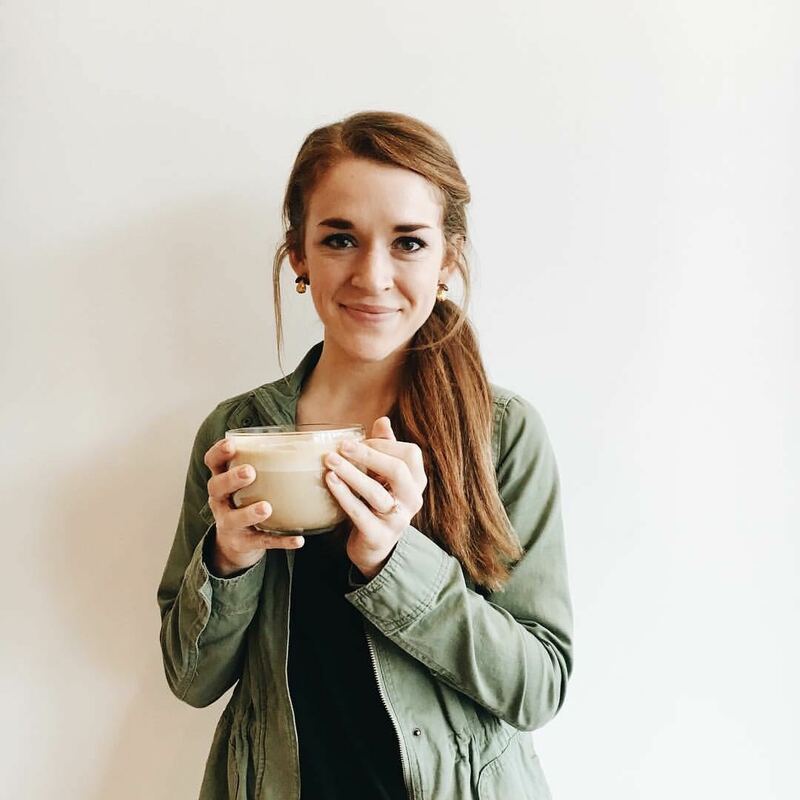 To be quite honest, most times I usually try not to focus on specific diets like Paleo or Keto or whatever the new thing is. I just try and focus on real, healthy ingredients and have a balance in my life with indulgence. 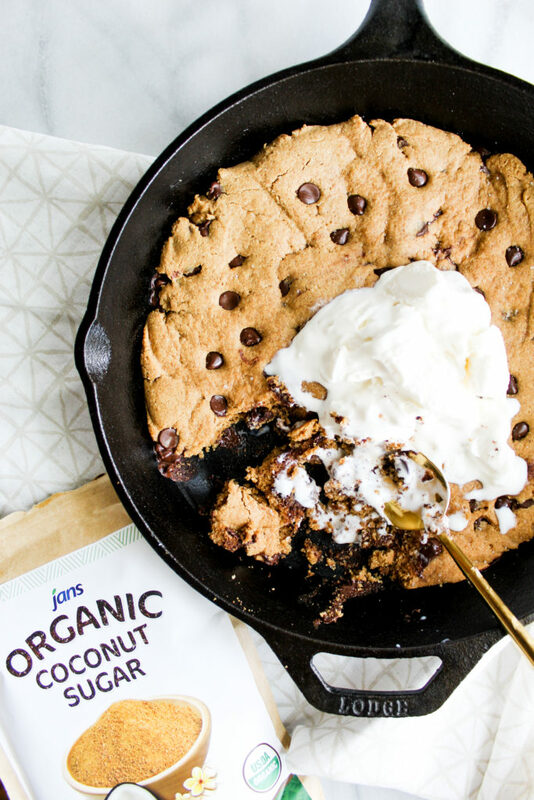 Somehow, this skillet combines both indulgence and healthy ingredients. YAS! My friends over at Jans sent me a couple bags of their Coconut Sugar and their Coconut Flour to make this recipe with. Both of these ingredients are organic and fully paleo. If you want to find more of their ingredients, check out their website! They are super reasonably priced and delicious! So, what is in this skillet you ask? Let me tell you! Not too shabby huh? 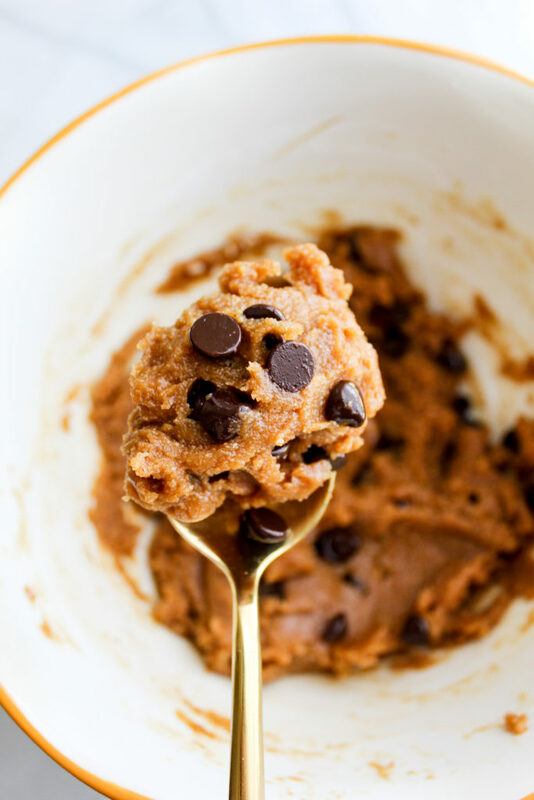 They’re all extremely simple ingredients that you most likely already have in your pantry! Score! The nut butter really helps add an amazing texture, not to mention a boost in protein and delicious peanut buttery flavor. Even though I used many coconut products in this skillet, the flavor of coconut was never overwhelming. It was subtle and delicious. 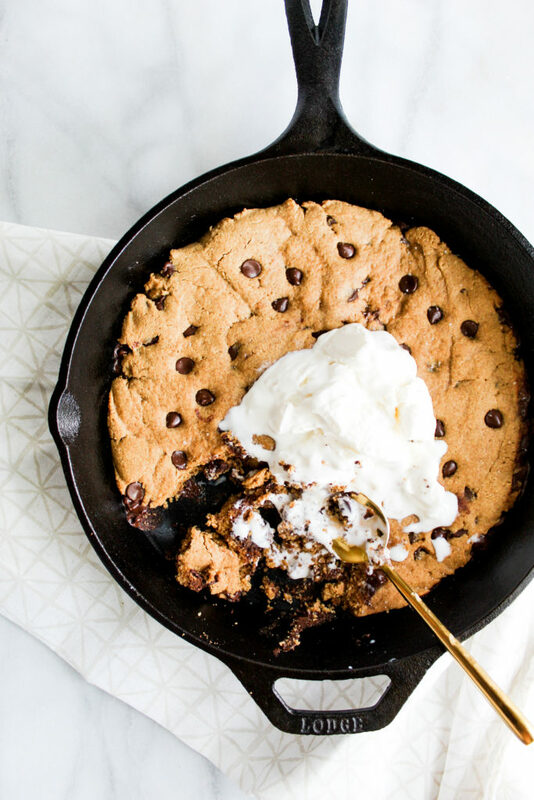 When slightly underbaked, this skillet is super gooey and has a crumbly texture. It is neither crispy nor crunchy. It’s simple, pure deliciousness. Also, I’m just going to go ahead and say the cringe-worthy word: MOIST. Yes, this cookie is extremely moist. I really appreciate how this cookie is more low carb and low in sugar thanks to the paleo ingredients. My blood sugar never spikes nor do I have a sugar coma crash after eating this deliciousness like I may have after eating a regular cookie. In regards to the size of the skillet, my cast iron skillet is 8 inches. I would recommend that size for making this recipe. You can always make individual cookies if you have those cute little small cast iron skillets. Oh, and by the way, if you’re wondering, the skillet lasts for a couple days as long as it is covered. I highly doubt it will make it that long. It surely didn’t last in my house. Hope you make this recipe soon and love it as much as I do! Preheat oven to 350. Add egg, coconut sugar, vanilla and almond milk to a medium sized bowl. Whisk together until combined. Add in melted coconut oil. Whisk again to combine. Add in peanut butter and mix together until combined. Add in your coconut flour, salt and baking powder. Mix with a large wooden spoon to combine. Gently fold in 1/4 cup of chocolate chips. Lightly grease your cast iron skillet with coconut oil. Add in your mixture and press the dough down to fit the pan. Add the other 1/4 cup of chocolate chips to the top of the mixture, pressing it down into the cookie dough. Bake for 15 minutes or until golden brown. Remove from oven and serve warm with a dollop of ice cream! Enjoy!